Aberdeen’s fifth spot in the list – behind Cambridge, Derby, Oxford and Ipswich – is thanks to annualised economic gross added value (GVA) growth of 1.5% in the final quarter of 2017. The UK Powerhouse study was produced by law firm Irwin Mitchell and the Centre for Economics and Business Research (CEBR). Its findings for Aberdeen are a boost for a city still struggling to come to terms with the recent oil and gas downturn, with business failures – particularly in the hospitality sector – still an all too frequent occurrence. But according to Irwin Mitchell and CEBR, the Granite City is shaking off its past overdependence on oil and gas. Their report highlighted the efforts of development body Opportunity North East to diversify the local economy, saying growth was achieved in a variety of sectors last year. In terms of total GVA, Aberdeen’s £11.2billion-a-year economy put each of the top four fastest growers well into the shade. Third-placed Oxford had the next highest GVA value among the top five, at £8.7billion. The figures – for the fourth quarter of 2017 – rank Glasgow and Edinburgh at 25th and 40th, with GVA growth of 1.2% and 0.9% respectively. 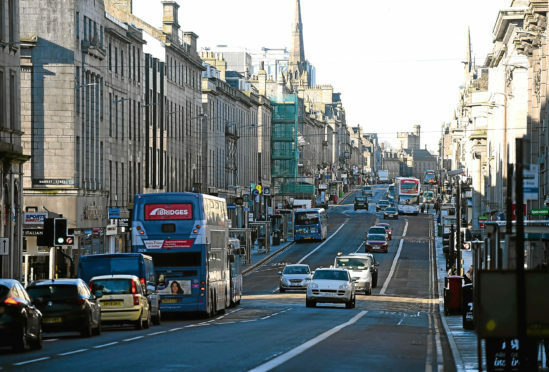 Aberdeen’s GVA growth is expected to slip to 1.1% this year amid a general economic slowdown.